It is not unknown for fans to fast before a Rajini release, as prayer to the Gods for success of his film. But, perhaps, in a part of the world that puts its film stars on very high pedestals, that’s not unusual. Try this. If you could possibly wangle a first-day-first-show ticket to a Rajini starrer, you will witness something you won’t see in a movie theatre, ever. Rajinikanth gets his very own credits styling. The screen will say ‘Superstar’, then his name will follow: ‘Rajini’ in English and then in Tamil, glowing in platinum. By the time your eyes adjust to the glare, you realise that you might also lose your hearing. Every member of the theatre audience is standing up, chanting ‘Thalaivar! Thalaivar!’ (which means ‘boss’ in Tamil). Then he will make his entrance: First you see the underside of his shoe; then dried leaves and debris will fly out of the way when the foot comes to earth. Then the camera moves above ground and pauses, looking up, as a supplicant would to the saviour. That’s when the noise in the theatre reaches a crescendo and… the credits pause. And you see, at the foot of the screen, the regional distributor, the multiplex manager, and a few other dignitaries, resplendent in crisp white veshtis, are standing with a priest, who begins to chant prayers. Which end with the men in veshtis holding out their right hands and performing an aarti by burning camphor on their palms. Then the crowd will settle down and the film will continue. Chances are, you’ll see the signature moves: The finger pointing skyward, deft handiwork with the sunglasses (in older movies, you’d have seen the cigarette toss; he doesn’t smoke on screen now, though). You’ll see gravity-defying jumps and hordes of bad guys being done in. Through it all, nothing will dislodge the Superstar’s smile and sunglasses. Rajinikanth’s story is straight out of the movies: Boy from the wrong side of the tracks makes it big. Born Shivaji Rao Gaekwad, he had a wild childhood and even wilder youth where his pranks got him into all kinds of trouble: He was thrashed by the cops for chasing girls and beaten by restaurant workers for trying to pass off an old six rupee bill for a table full of food that he and his gang had demolished. The tale of how he moved from bus conductor to stage to screen is too well know to retell. Suffice it to say that for all his hell-raising, there was a talent which his friends recognised and people noticed first on stage. His wild ways were temporarily tamed when playwright and director ‘Topi’ Muniappa offered him a chance to act in mythological moral plays. The story goes that he played the villainous Duryodhana so well, he was applauded by old men when he was ripping off Draupadi’s sarees. Hindi cinema, which was yet to become Bollywood, was, like much of Indian cinema, entangled in social themes. South Indian cinema, especially, was dealing with morality issues, which was fantastic for a performer like Rajinikanth, because he played the villain with much glee (shades of this are visible even in his blockbuster hit Chandramukhi, where his demented, ‘Laka, laka, laka, laka’ still sends shivers down one’s spine). 16 Vayathinile (At the Age of 16) paved the way for unkempt villains who had a singularly disgusting laugh. Mithun Chakraborty ruled 80s Hindi cinema with the same brand of impossible heroics and made-for-the-front-row lines, and inspired similar devotion from his fans. But it took Rajinikanth to not just find the formula of punch-line-laden, impossible-action-packed movie persona, but to make it work for over three decades. And counting. That he was talented was evident to the director K. Balachander, who offered him a 15-minute role as a drunkard in Apoorva Raagangal (Rare Melodies), a Kamal Haasan starrer. Rajini made an impact as the man who muddies the love story by announcing a prior claim to the affections of the heroine just before she admits her love to the hero. His mentor/teacher at the film institute, Puttanna Kanagal, gave Rajini his first Kannada movie Katha Sangama (Collection of Stories), where he played a baddie, a man who rapes a blind girl. Rajini played negative roles with ease, and it was just such a villainous role that first offered him a chance to flick his cigarette in the air and flourish his sunglasses. The film was Moondru Mudichu (The Three Knots), in which he played the friend who creates trouble between Kamal Haasan and Sridevi. The movie became a hit and established Rajinikanth as a super villain. Rajinikanth, Sridevi and Kamal Haasan in a movie meant registers ringing at the box office. But Rajini was restless. He wanted to taste success in Bollywood as well. And though he worked with Amitabh Bachchan and other major stars, the Punjabi lobby dominated Hindi cinema. Dark-skinned Rajini chose wisely, and returned to his millions of fans. But note this: His Billa, an almost frame-by-frame copy of the Bachchan starrer Don, made more at the box office than the original. Billa, in fact, marked the beginning of the Rajini cult. It was clear from here on that he could carry the weight of a movie by himself. What’s his secret? How does this 60-year-old grandfather, who makes no attempt to conceal the fact that the little hair he has left is very grey, transform miraculously — and credibly — into a limber young chap with a full head of shiny black hair, who wears jeans and whips up bad guys as easily as he polishes his sunglasses? Partly, it is the focus. After his initial experimentation, he did not attempt to stretch his range, as with the thespian grandstanding of his illustrious contemporary and great friend, Kamal Haasan. He stuck to what he did best, and made that all his own. (Recently, he said that the two of them had struck a gentlemen’s agreement to not cannibalise on each other’s territory.) He wanted to hear the chants of ‘Adhirudhile!’ (‘Rocking!’) from the cheap seats, and he worked hard to ensure that he kept earning it. Partly, he’s a nice guy, someone who pays his dues, with a sense of responsibility. Like when Valli and Baba failed to bring in expected profits, he returned the money to the distributors who had made a loss, earning their loyalty forever. Partly, it’s the simplicity of his image, the impossible, uncomplicated heroics that give the man on the street something to cheer. Like splitting an oncoming bullet into two with his knife, dodging both split halves, then smiling as each half hits a different baddie and his knife plunges into the heart of the man with the gun. Or how about saving the heroine, who is strapped to an electricity transformer, by running faster than electrical current after a vengeful villain switches the electricity on. Certainly the whiplash actions, the mannerisms, the gimmicks, if you will, contribute to memorability. But face it, there is no film school theory that explains why he can make the viewer not just suspend disbelief but chop it into little pieces, set fire to the remains and stomp on the ashes. There is no intellectual explanation for why the corny rhyming punch lines are such a hit. Purely and simply, Rajinikanth makes the whole package work. Only he can. That’s why there are thousands of dedicated fan sites, whose members would rend you limb from limb should you even think about dissing the Superstar. That’s why even today, the script, the story, the dramatic lines, the costumes of a Rajinikanth movie — they’re all treated like a national security issue. Fan clubs go into frenzy at the slightest hint of a leak and with every movie Rajini and his producers laugh all the way to the bank. That’s why when Kuselan, not as big a hit as Baasha or Padayappa, was shown across the USA, the candy giant M&M made specially-coloured bites of joy to be made into giant posters of the star; M&Ms were distributed to kids and his fans stampeded the halls as though it was the last show on Earth. In Japan, he is the ‘Dancing Maharaja’ — and to this day busloads of Japanese tourists stop by his Poes Road home in Chennai to take pictures. In Malaysia and Mauritius people expect to be granted leave from work when his movies release. It doesn’t matter whether you are originally from north of the Vindhyas, you find yourself whistling and stomping your feet, pretending there are villains there, crushed! Or will he just keep being Rajini? His Endhiran (in theatres October 1) released a trailer that was shown in a special 10 a.m. screening. Tickets cost Rs. 70. It was sold out. A trailer. Could anyone else command such a following? I can bear witness that his star power is intact. There was this time I was in Chennai, and was headed to the airport to catch a flight. But my cab ran into a massive traffic jam. Apparently the cops had blocked off the road because the then-Chief Minister was to land in an hour or so, and it had been deemed essential that her road home be kept clear by simply not allowing any other traffic to move. Certain I’d miss my flight, I was panicking. That’s when I saw the man himself, talking to the police about three or four cars ahead. They didn’t relent. So Rajini simply stepped out of the car, took out a pack of cigarettes, lit one and sat on the bonnet. Within minutes, the road kept empty for the CM was swarming with people who had come out of nowhere. Clearly the black-caped lady would have as much of a wait as the rest of us. The policemen knew what was good for them. They pleaded with him to get back in and waved him and quite a few other cars through, my cab included. I made my flight, thanks to Rajinikanth. Here comes another insane article about thalaivar. I am research scholar working in an analytics firm and I am following Rajni for 27 years. I strongly condemn the author's view. Oh, pls stop this nonsense articles. Pls media and publishing houses, first know what your authors are posting on your websites. It is actually degrading your brand value. I really had a good opinion about forbes but now I've changed my mind now. I do not rely brands which endorses such article. Oops I wasted 5 mins posting comments after reading stupid artciles like this. People, reading this is seriously a waste of time. LOL gravity defying stunts, then you should probably start writing about batman, superman lol..flying out of earth..LOL! seriously! It is utterly disturbing to see the article written in this way. We love him and this article tickles some nerves. what is a "Southern Super Start"? Call him a "Indian Super Star". Why wouldn't you call Shaurukh khan a "Northern Super Star", why would you call him a Indian Super Star? Even Hindi is a local language, local to only 36% of the population. So just stop this branding of anyone south of Vindhyas as Southern people and all the others are Indian. What trash is this, and Forbes encouraging this because it thinks that Bollywood is "Indian Film Industry" and all the ones who are employed are "North Indians" and they are very conveniently carrying this ignorance about India. have you ever watched all of his movies..... if you did, you would not have written this article in this way, no offences. the delivery of dialogue and the inner meaning of thoughts combined with charisma of thalaivar is un matched... he is not just charismatic in acting but its way of his life... if you don\'t know Tamil language learn it and watch all of his interview, you will know why he still stands as superstar even after 30 years and why there is so many fanfare for him... i still remember when i was searching my identity during the time i used to waste lot of time not concentrating on work.... on that time i have seen one interview of him in which he has said that \"the one who waste time will never succeed \" and how much that changed my life.... i would recommend you to watch 1) Thillu mullu 2) aril irunthu arubathu varai 3)guru sishyan this is enough to tell you his acting skill \"When she realised who the mendicant really was, she apologised. Rajini, they say, kept the note as a reminder and as a reward for his acting skill.\" ..... thank for your genorisity in praising him but please keep it with yourself. 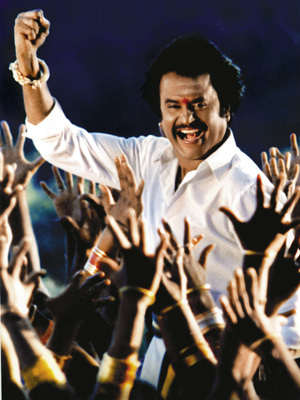 Apart from his charisma, Rajni has become a phenomena thanks to helpful work done by the media too. Btw, a correction in this article. "Idhu eppadi irukku" means "How is this" and not "How are you". Rajini always acted for the comfort of public, he can give quality acting, entertainment acting, only the public should understand, that is his motive. Kamalhasan, on the other hand, is a ego person, and he always entertained his group of limited fans. That is why, he is No. 32 in the world, and super star is no. 1 in the world as far as popularity of actors is concerned. You can complain when Kamalhasan turns no. 2. Even though you are a great fan of super star, you tell that kamalhasan is giant. In what way he is giant? by knowing technical thing, you cannot be a giant, you should communicate well with the public, then only you are giant, otherwise you are upma actor. "Cheap tickets"? Have you any idea how many highly educated and well bred south Indians idolize him? Seriously! Live abroad in any country and you will explicitly see what i mean. Such SHOW OFFs. So many south Indians, after having achieved so much, live without commotion. What is the problem, we admire humility and honesty more than fake skin. Do we ridicule Bollywood movies and actors? Why cant we all live peacefully without imitating or irritating others? It's quite astonishing how so many north Indians (have REAL exp with them) think that South Indians feel inferior to them. Being quiet is not feeling inferior. It's called growing up. There was a movie where there's a village on fire and then Rajini has had too much to drink and then he douses the fire by urinating on it ..... oh wait .. that was Gulliver's Travels .. Maybe somebody will quote this in another article .. Here we go... one article .. and north Indians.. South Indians... Tamilians all have started appearing... :-( I would like to see Rajni "Spiliting a bullet in two" in next movie if he has not done it yet. What I know is he is a great entertainer and this is what is required. PERIOD. Might be by Luck or Hard work. God Bless ALL. This article has North Indian Bollywood ego... Manisha.. "idhu eppidi iruku" .. how is it. And in the last paragraph, you mentioned the incident which actually happened years ago. But you wrote as if it happened on the day you wrote this. There are lot wrong references all over the article. Coming to your Bollywood ego, do you know who won the most no of international awards, whose movie is screened in lot of int'l film festivals? It's Manirathnam, do you who is highest paid director in india.. its Shankar.. do you know to whom hrithik surrendered himself completely in a stage.. its prabhu deva.. Do you know by whom Bollywood's top directors want to handle the camera.. its rathnavelu.. or nirav shah.. And india's top editors also from south india.. all your Khan's and Kapoor's movies are edited by them and will be. And music.. I dont have to say.. Very poorly researched. There is no movie of Rajini where the "splitting the bullet" scene appears. And neither the "outrunning electricity" scene. The first image has a subtext, mentioning Sivaji followed Baba. It's not. It was Chandramukhi, where he came back big after the Baba debacle. Writing with a sarcasm is up to the author. But should get the basic facts right. Hah, another North Indian author with a bias. One would assume that the author would take a bit more responsibility and put in some hard work researching a subject before writing on it. The running faster than electricity scene is by Dharmendra in a bollywood movie and the using a knife to split bullets thing is just some internet troll, never in any movie. Why don't you back up your facts with the movie names. Ithu epidi iruku is - How is it? not How are you? Manisha - your article has an underlying tone of mockery aimed at some of his mannerisms and movies. Why can't some of you people accept that he is the biggest star in this part of the World (probably) the world? We are all well read and some of your lines such as "worked hard to ensure cheap tickets applause" wont go unnoticed. If you are genuine in your appreciation and understanding and write an article that is genuine to your credibility and journalistic capabilities - everybody will surely appreciate it wholeheartedly. Else, through this article, I can sense an urge to write about Rajini but demeaning him subtly but still garner enough page hits and visits to your journal and post. I have no animosity towards you but this is just my impression after your article. And, this comment shall be published un-edited, if you respect freedom of expression. Thanks, Nathan Charlotte. And the most popular myth resurfaces. There is no movie of Rajini's where he splits the bullet into two with a knife, nor is there any movie showing him outrun electricity. The author needs to stop plagiarizing cheap stale forwards to churn out a cliche article such as this, that in the name of praising thalaivar is simply making a mockery out of him! Super Star is Superb. He will not go into political way but political persons don't come into his way! Better understand babe. I think the author needs to do more research on the subject.. and some of the points noted are simply wrong such as the kamal-rajini thing.. Anyway this is one of the very few articles written by a North Indian journalist in good spirit about "Thalaivar". Most of the others bring in their king sized EGO of Bollywood's so called greatness into the article and trying to belittle the greatness of "Thalaivar" or trying to make fun of him as if their movies are the epitome of logical screenplays. Long live "Thalaivar" !!! Typical North Indian style editorial, trying to blemish the Tamil cinema. Being obsessed with Hindi cinema and living in delusion that only Boolywood is face of Indian cimena, the author has explicitly exposed her shortcomings. Has not the author ever seen any illogical, irrational, impractical acts from Amithab, etc...north Indian actors. This article is nothing but another piece of north indian ignorance, incompetence and jealous. Can India Pull Off The Commonwealth Games?